Very pleased to announce the new edition of my book “Alexander Payne: His Journey in Film” releases September 1. The book is a passion project of mine that I am happy to share with the world. 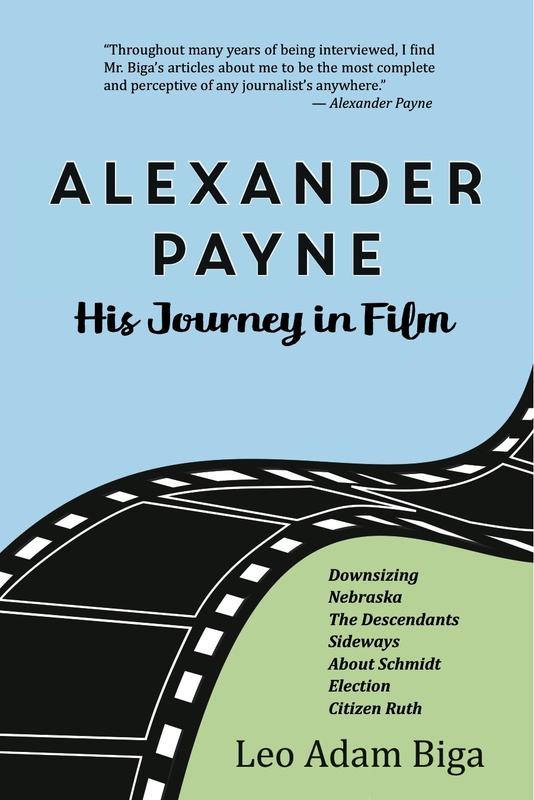 If you are a cinema lover and a Payne fan, then this is a must-read. “Alexander Payne: His Journey in Film” charts the Oscar-winning filmmaker’s rise to the elite ranks of world cinema. Articles and essays take you deep inside the artist’s creative process. It is the most comprehensive look at Payne and his work to be found anywhere. This new edition features significant new content related to “Nebraska” and “Downsizing.” We have also added a Discussion Guide with Index for you film buffs, critics, filmmakers, educators and students. The book is also a great resource for more casual film fans who want a handy Payne primer and trivia goldmine. The book releases September 1 from River Junction Press and sells for $25.95. As an author-journalist-blogger, I write about people, their passions and their magnificent obsessions, and no one more epitomizes that profile than Alexander Payne. I mean, he waited 10 years to finally make his in-progress new feature “Downsizing.” That’s passion, that’s commitment, that’s holding onto a magnificent obsession until realized. Payne is one of the most passionate people I know. Besides talent, his driving, all-consuming passion explains why he’s been able to make the uncompromising films he’s made in spite of the myriad pitfalls and challenges that confront any motion picture project. I have covered his filmmaking journey almost from the start. In 2012 I turned my in-depth reporting about him into “Alexander Payne: His Journey in Film.” It is a passion project for me. Though I am a generalist who writes about anything and everything, there are a few subjects I keep returning to again and again. Some of these are societal and cultural in nature, others historical. But there is one particular individual who occupies special emphasis among all my writing and reporting: Alexander Payne. The filmmaker, who has given us such works as “Election,” “About Schmidt,” “Sideways,” “The Descendants” and “Nebraska,” is actually part of a larger interest in film I have cultivated for decades. I got hooked on movies as a teen. I did film programming for a decade-and-a-half. Since the mid-1990s I have written hundreds of stories as a film journalist. Many of my film interviews and profiles focus on Nebraskans in film. I am developing the Nebraska Film Heritage Project as a print, online, lecture and curriculum vehicle for documenting and celebrating the achievements of Nebraskans in film, past and present, both in front of the camera and behind the camera. Payne is the epitome of the passionate creatives I interview and profile. His magnificent obsession with film ranges from an encyclopedic knowledge of world cinema to support of film preservation and education efforts to pursuit of great film projects. From his very first feature, “Citizen Ruth,” on through his last completed film, “Nebraska,” he has satirically, thoughtfully explored a wide expanse of the human heart and soul. He’s paid particular attention to relationships, but he’s also touched on abortion, politics, mid-life crisis, loneliness, identity issues, addiction, depression, love, romance, infidelity, death, family, alienation, old age. The film he’s making now, “Downsizing,” which releases in late 2017, will offer up his most expansive take yet on the world with the satire this time revolving around themes of depleted world resources, sustainability, technology, geo-political tensions, terrorism, corruption, exploitation, discrimination and civilization. He and co-writer Jim Taylor are exploring the very nature of what it means to be human and how we create society. Where his previous films have been more intimate in scale, he is working on an epic canvas here, though the ideas are distilled into the closely observed personal story of one character, Paul (played by Matt Damon), whose life is the prism through which all these intersecting storylines and themes are played out. In terms of ideas, it may be the most ambitious American film since “Apocalypse Now” or “The Deer Hunter” or at least since Avatar. My extensive coverage of the acclaimed writer-director has resulted in a deep body of work about him and his films that I have put into book form. The new edition of tha book now available this summer features expanded and enhanced content that brings you right up to date with his latest project. The book will be available at other venues, including bookstores and gift shops, during the course of the summer and fall. It is also be available through Barnes & Noble, on Amazon and for Kindle.